Seatrack comprises two software packages that provide a one-stop, integrated performance, tactical and navigation system. It gives owners a choice between Seatrack Grand Prix and Seatrack Smart. Grand Prix has been developed to meet all possible requirements for racing inshore and offshore and is run on a Windows platform on a laptop. Seatrack Smart, on the other hand, has been developed primarily for inshore racing as an economical alternative and is run on an Android tablet. Bearing in mind that the systems will be operated at sea, sometimes in bad weather and more often than not when time is of the essence, the highest priority has been given to ease of use. The Grand Prix system accesses data from the boat’s instruments, manipulating it in a multitude of ways that generate a wide range of race-winning performance indicators and projections. 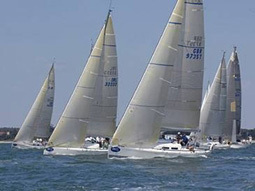 These include constant monitoring of the yacht's performance against its polars, information on sail selection for the current and future legs of a race, optimal positioning and timing at the start line, laylines and course to steer, together with 18 other integrated functions, all of which are set out at the Software Page. Seatrack Grand Prix software is compatible with Windows ME, 2000, XP, Vista, 7, 8 and 10. Seatrack Smart’s range of functions (set out at the Software Page) is less broad than Grand Prix’s but nevertheless still provides vital information needed for competitive inshore racing. It can rely on its own GPS and user input for wind data or, ideally, Seatrack Smart can be connected to the boat’s instruments via Wi-Fi. Considerable time and effort are devoted to coaching for Seatrack owners. Individual training, together with web based sessions, pay great dividends in terms of maximizing both the competitive advantage and safety aspects derived from yachts' Seatrack systems. Fees for training sessions vary according to duration and location. For further information see the Training Page.